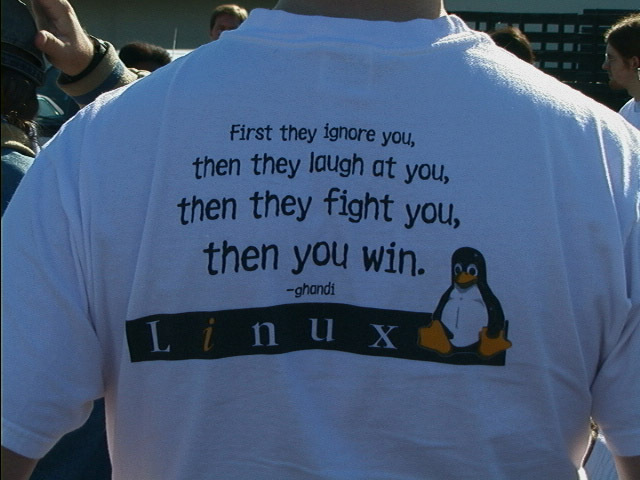 This is the same quote that is emblazoned on the wall at Redhat HQ. I hadn’t seen it on a shirt before though, I’d be interested as well. Hey, bro! Great to have you stop by. I wasn’t aware of the quote being on the wall at Redhat. That’s cool. Thanks for the visit. It is ‘Gandhi’ and not ‘Ghandi’ ie. the quote is attributed to Mohandas Karamchand Gandhi. how about selling them at UTOS as a fundraiser – keep them away from any vendor specific logo and I’m sure they will be a hot ticket. I’ll buy several – a couple for me and several as gifts. “emblazoned on the wall at Redhat HQ” Anyone have a photo of RedHat HQ?